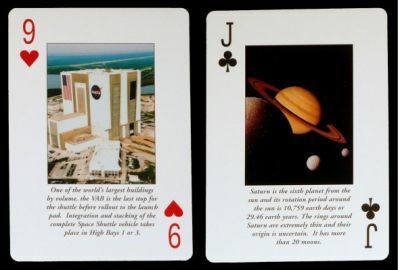 This pack of 52 cards, 2 jokers and 2 title cards has been published by the Kennedy Space Center (www.kennedyspacecenter.com), located in the east coast of Florida. Another pack of cards which commemorates the NASA 50th anniversary can be found in there shop. It may have been printed in smaller quantity because it is one dollar more expensive. Both packs have 52 colour photographs. In the first one, each suit is dedicated to one topic: shuttle for spade, toward the moon for diamond, planet for club and the KSC itself for heart. The joker is a collage of all nine planets. Price and where to find: It is sold for USD 5 in the KSC Visitor Complex shop (www.thespaceshop.com).